I first came across Galloping Major when I was searching for figures to play Muskets & Tomahawks with a few years ago. Their French Indian War range is very nice indeed. 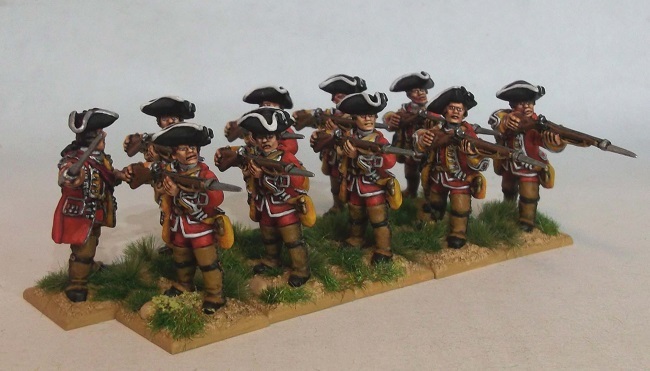 They have recently launched a Kickstarter project to fund a new range of British Redcoats which will start to see regular forces added to their range, as up until now they have concentrated on the more irregular forces, such as Rangers, Militia, Provincial forces and the Indian Allies for both sides. I find these figures unusual in that they include poses of figures using a bayonet drill that I have not seen before (although I am certainly no expert on this period or the available figures!). As well as Regular Hat Men, they are also looking to produce firing line poses for the 60th Foot. At time of writing, the project is a whisker short of it’s £4,500 funding target, but has loads of time to run, as it doesn’t finish until 28th August, with delivery due in December 2016. Galloping Major produce some fantastic looking, well researched figures, with sculpting and casting quality being top notch. The company is one of those classic one man cottage industry wargames companies that so deserve our support. If you are interested in this period, then this project is highly recommended.